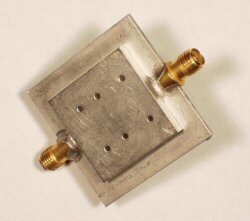 Build the breadboard drain-pulsed amplifier described here and you will have a useful piece of test equipment for your microwave laboratory, for very little cash, you cheapskate! It provides up to 20 dBm peak power, and operates from 2 to 20 GHz, when driven by a laboratory sweep oscillator and a pulse generator. Why would you build your own modulator when a basic sweeper provides this function? Our modulator is much more versatile than the cheesy modulation function that is built into a $50K synthesized sweeper, and it will only cost you a couple of bucks! We'll give you faster rise/fall times, and shorter pulse widths than Agilent does! Much of the material on this page was contributed by Justin, Wayne, Romeo, and Greg of NASA, who took an idea they got from Microwaves101 and made it into real hardware. Thanks guys, especially for all of the different data! The heart of the Microwaves101 breadboard pulse modulator is an amplifier that you turn on and off by pulsing its drain bias voltage. There are tons of amplifiers out there that you could use to create a breadboard modulator. We have two suggestions (from Hittite), based on availability (free! ), wide bandwidth, and pretty good power. The HMC462 and the HMC463 are marketed by Analog Devices as low noise amplifiers. Click on the links below and we'll take you to their data sheets. Both are surface-mount products, so you don't need to worry if you don't have a wire bonder at your disposal. If you ask them nicely, Analog (was Hittite) might supply you with some free samples of either amplifier mounted on a connectorized evaluation board, all built up. Hittite used to make you fill out an annoying request sheet before you get any free parts. We're not sure about Analog, maybe someone can tell us if they are giving out free MMIC candy these days. Here's pictures of the two choices, mounted on Hittite-supplied evaluation boards. The pictures are not to scale, the amplifier packages are the same size. Note the nice heat sinks on the backsides, and well-wetted RF connector solder joints. Hittite thought of everything... except they assembled the HMC463 with one of the tantalum capacitors backwards (it has been fixed in the photo). Obviously they don't test this stuff before they ship it! 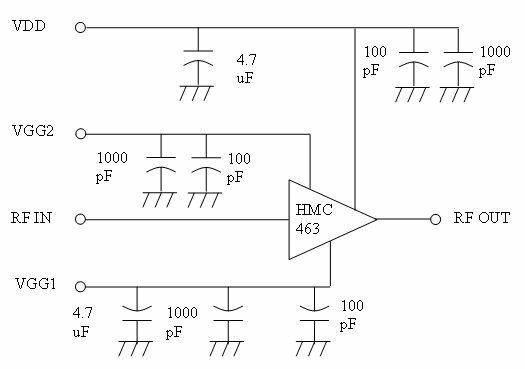 Here's the tradeoff: the HMC462 is self-biased, so you only need a single +5 volt supply. The HMC463 has three power connections: VDD supply (nominally 5 volts), VGG1 gate bias (nominally -0.6 volts but should be adjusted to set the proper drain current), and VGG2 gate bias, the cascode gate connection which allows some gain control (but it can be grounded for this project). The HMC463 might be slightly more complicated to operate, but it delivers more power than the HMC462. According to Analog's data sheets, the HMC462 delivers 15 dBm at 2 GHz, and 12 dBm at 20 GHz, while the HMC463 delivers 20 dBm at 2 GHz and 13 dBm at 20 GHz. Self-biased designs always put out slightly less power then their normally-biased counterparts, because the source resistor that biases VGS to a negative voltage eats up some of the available output voltage swing. You decide which one you can live with, but always remember "the best idea is the simplest one that works". That's an Einstein quote in case you didn't recognize it. Both the HMC462 and HMC463 draw less than 70 ma at +5 volts on the drain bias. 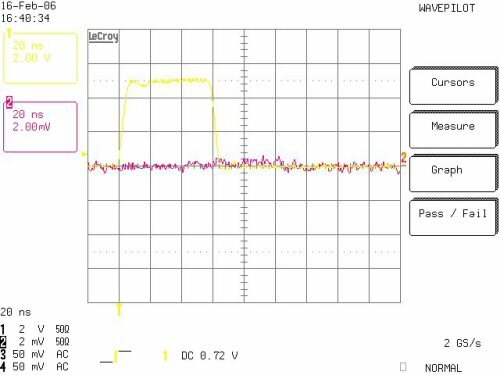 The HMC463 should not have its drain voltage (+5 V) applied without its gate voltage (~-0.6 V), but with low power amps (such as LNAs) you can get away with short periods of time where this is violated. We've operated it for hours with VGG1=0 volts and never observed reliability problem, but don't expect its RF behavior to be OK without proper gate biasing. In any case, you won't need any elaborate power supply sequencing circuits to "baby" the device. You cab set the current limit on your power supply to 100 mA if you are worried about stressing the part. Note 1: in this modulator application you don't need to pulse the VGG1 signal, just leave it on while you pulse the drain supply (VDD). Below is a schematic of the Hittite evaluation board for the HMC463LP. 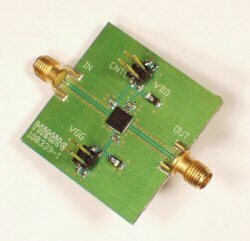 The schematic for the self-biased HMC462 is very similar, but simpler (there are no VGG1 and VGG2 connections.) The drain supply network is the same, with three bypass capacitors (100 pF, 1000 pF and 4.7 uF). Always locate the low-value caps (100 pF) closest to to the MMIC. Basically, you will be following our directions for using a MOSFET driver for pulsing the drain of a MMIC amplifier, which we have detailed on a separate page. 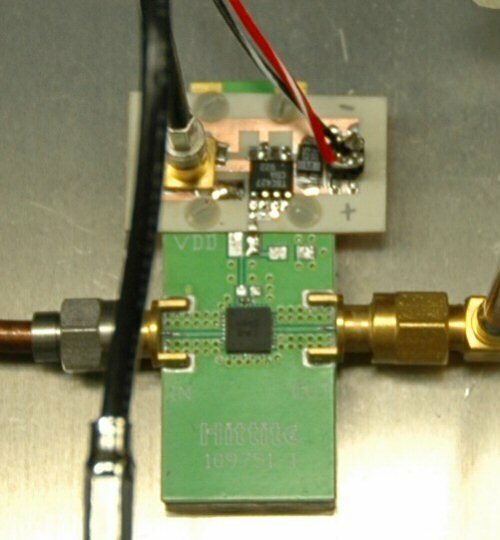 You will have to make some modifications to Analog's evaluation board to operate the drain modulator, shown below. 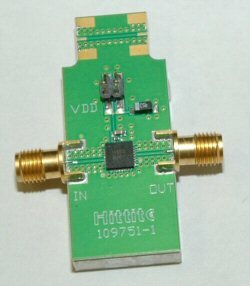 The HMC463 is shown, the modified HMC462 schematic would be the same but without the VGG1 and VGG2 connections. The data sheet shows a 4.7 uF cap on the drain line (C3) . You will move the capacitor "upstream" on the supply side of the MOSFET modulator, otherwise it will slow down the modulator. The cap is there for stability, but the MMIC amplifier will still "see" the capacitor when the modulator is on. Trust us, it will be stable with this modification, and it will help act as charge storage to keep the drain voltage constant while the pulse settles. If you have long power supply leads (more than 12 inches perhaps), you probably want to mount even more charge storage on the MOSFET driver supply (as many 4.7 uF caps as you can fit). 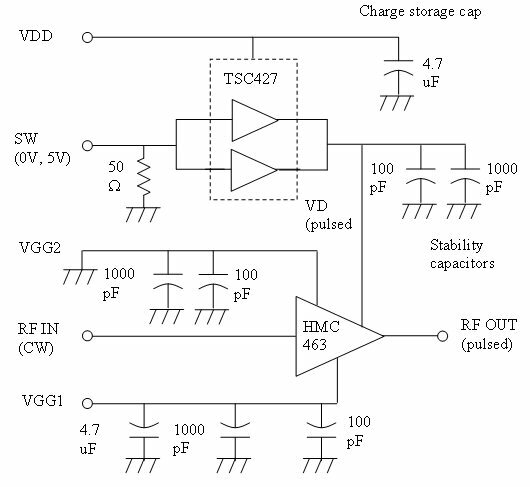 This M101 page delves further into the topic of charge storage. The MOSFET driver should be mounted no more than an inch or two away from the amp to obtain the fastest rise/fall times. Farther away and you will slow down the VDD drain supply pulse and maybe add some ringing (overshoot). You can either dead-bug the TSC427 MOSFET driver right onto the evaluation board (there's room), or make a second PC board to hold the MOSFET driver, (like Justin did below). Here we have violated a "rule" of MOSFET drivers, by ganging the dual driver in parallel (oh no Mr. Bill, one of them might hog the current!!!) This improves the switching speed, but if you are planning on sending the Microwaves101 Pulse Modulator to Mars, you might not want to do that. In any case where you only use one of the two available drivers, be sure to tie the input high or low on the unused driver to keep it out of trouble. Keep the power supply leads short for high-speed performance. You can experiment with some axial capacitors across the power supply output terminals to act as charge storage when the modulator is operated at various pulse widths and duty cycles. 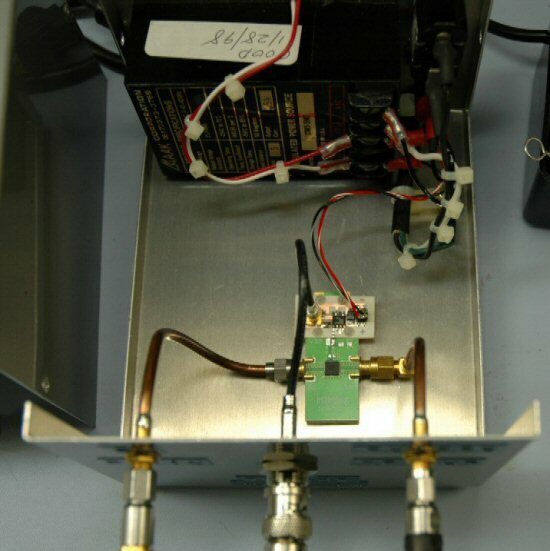 It's good practice to bring the input trigger pulse to the MOSFET driver through a coax line. You can probably install a BNC or MCX connector by drilling a hole on the eval board. Shorter connections are generally better for speed, but coaxial connections will minimize problems, even with several feet of cable going to your pulse generator. When you first try out the modulator, try it "ON" (not pulsed) to be sure the amp is working (measure the gain of the amp to verify). Note 3: when you pulse it, the drain current will decrease roughly by the duty factor of the drain pulse. At 10% duty, you should see only have 7 ma DC current. 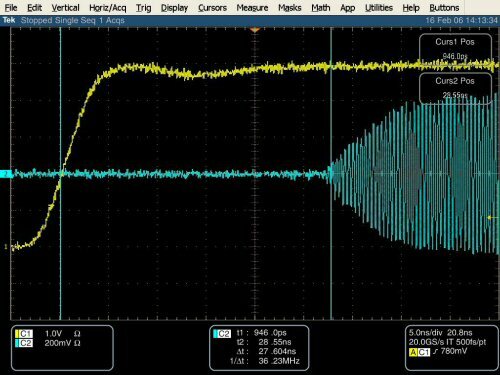 You can get an idea of the RF rise time by looking at the VD waveform. If it has 5 nanosecond rise/fall times, the RF will too. If the rise time is too slow (like 50 ns), put on some more charge storage or shorten the power supply leads: maybe 20 uF will be better than 4.7 uF. 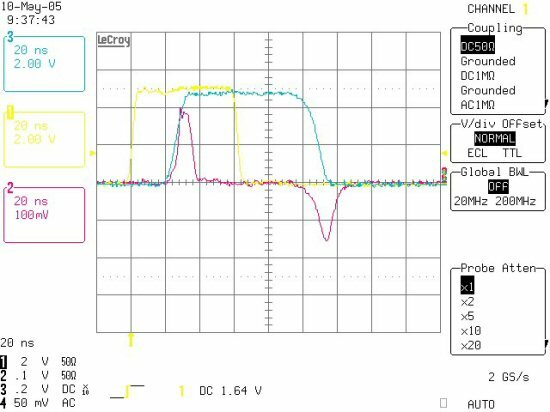 Note 4: remember to check out the DC input waveform with the MOSFET driver turned ON, otherwise it will load the pulse generator down and look ugly! 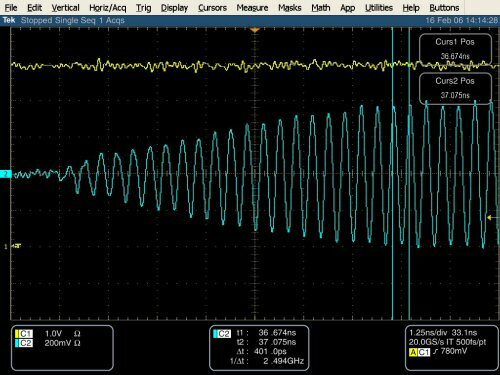 The final proof that you have a well modulated signal is to put a detector on the output and display the pulse envelope on an oscilloscope. Be sure not to exceed your detector's maximum input power rating. Note 5: you may have to buy a "high speed" detector (like one from Krytar) so that the detector is fast enough to measure the pulse characteristics accurately. Look at the output capacitance specified for the detector, 3pF will be 10X faster than 30pF... 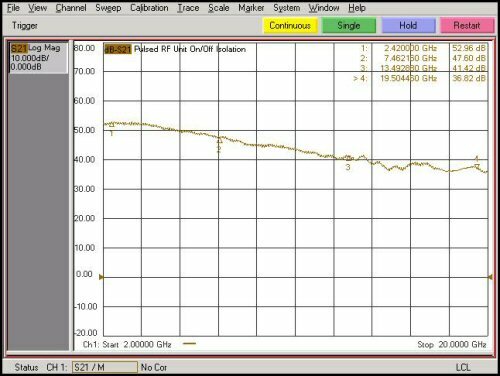 Even better, get a high-speed sampling o-scope and look at the modulated waveform in real time! 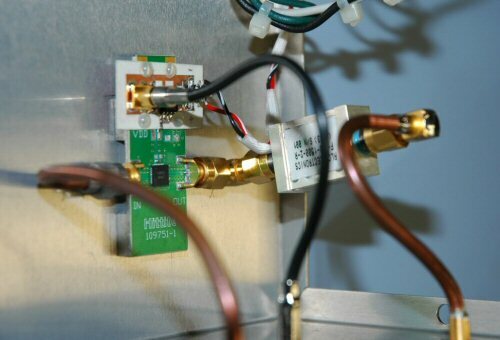 Again, we can't thank you space cowboys enough for submitting this stuff to Microwaves101! Below are two pictures of the Hittite HMC462 amplifier and the new "daughter board" that Justin, Wayne, Romeo and Greg fabricated to add the MOSFET driver to the amplifier. The first photo shows a fit check prior to assembly, the second picture shows all the components mounted. Looks like an MCX connector brings in the pulse command, and there's the 4.7 uF cap that is used for charge storage. Yup, the polarity seems correct! In this case they took off the 1000 pF ceramic cap from the drain connection of the amp, but didn't add it back on the supply side of the MOSFET driver. We recommend that they put it in parallel with the 4.7 uF tantalum cap, it can only help sharpen the pulses (but perhaps an insignificant amount). By the way, that's the HMC462 amplifier being used here, not the HMC463. Thanks to Gerry and Justin for clearing that up! Here's the chassis that the boys from NASA mounted the part in, which contains its own 5 volt DC power supply (looks like it was recycled from a seven-year-old project, such reuse is always admirable). Nice job keeping the power supply leads short, and the coax line going to the pulse input is another good thing you might want to copy if you try this yourself! Semi-rigid cables bring the RF in and out to bulkhead SMA jacks on the front panel. A truly fine piece of breadboard equipment is born! Here are some thumbnail pictures of the box, which has been nicely labeled for posterity. Click on them and you'll see larger views. The modulator is driven by an HP 8112A 50 MHz pulse generator, which is set up for fifty ohms (hence the modulator's terminating resistor is fifty ohms). Here's a scope shot of the input pulse, the modulated drain voltage, and detected output, with the RF off. The "glitches" on the detected output can be cleaned off using a high-pass filter (which is on order). 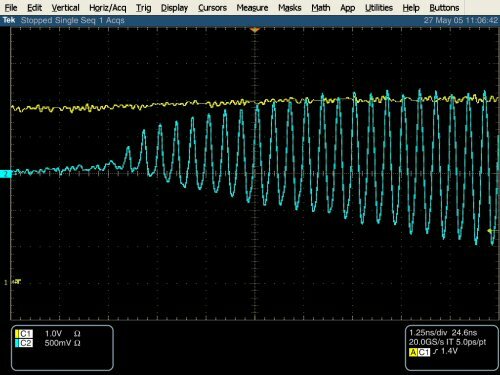 See our page on oscilloscope measurements if you are interested in this topic. As you can see, there is one "spike" that occurs when the amp is turned on and another when it's turned off. The detector didn't pick up the turn-on spike because it's positive (or negative, whatever). The spikes are high-amplitude but relatively low frequency. According to the spectrum analyzer, it seems as though their frequency components are mostly contained below 250 MHz, and almost completely gone at 600 MHz. Therefore, I don't think they'll cause any huge problems. A coaxial hi-pass filter on the output would to clean this up. Here's a scope shot of the detected output with the RF on. Notice the detector produces a negative voltage, this is due to the way the detector diode is oriented (and is generally the case). Here's two shots taken on a sampling oscilloscope, where you can see the RF waveform. There isn't a lot of lab equipment that is cooler than a high-speed sampling o-scope! In the first shot you can see the switching delay of about 20 ns, and a rise time of perhaps five or ten nanoseconds, depending on where you consider it "on". Good thing this wasn't a "classified" presentation! Notice that 1/PW is the distance between the spectral lines (1 MHz), and 1/PRI is the distance between the minimum of the smaller lobes (1 MHz). 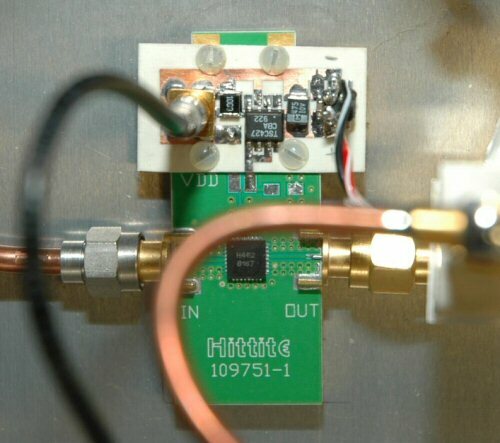 This is correct because the amplifier added 13 dB to the -10 dBm input signal. It's nice when algebra works out! 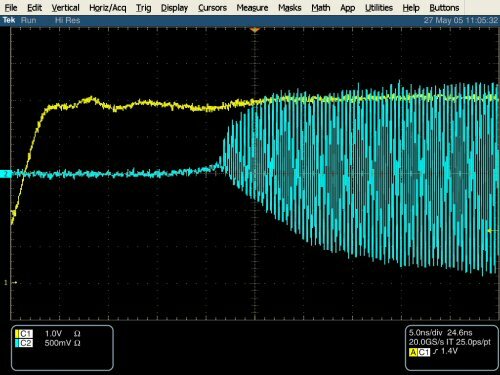 The plot below is the measured on/off isolation of the modulator measured on a network analyzer. The isolation is a function of frequency (isn't everything? 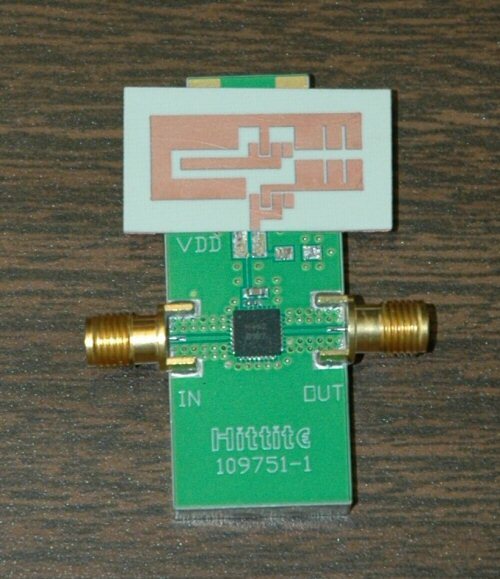 ), providing more than 50 dB isolation at 2 GHz and more than 35 dB at 20 GHz. This is better than you could do with a cheap MMIC switch, at the time the modulator was made (2006). If you need better on/off isolation, you will have to spend more money, and perhaps build an expensive hybrid with PIN diodes and a fancy driver circuit. Shielding on the board will become a headache as well. Justin sent us some more info on the modulator project, it just keeps getting better and better. One of these days the Lazy Unknown Editor will distill this page down a little, but right now, it's Miller Time! 1. Replaced the 50 Ohm square wave input resistor with two piggybacked 100 Ohm resistors. The new resistors are each 1210 surface mount size so together they can take up to 1/2 Watt. Now it's OK if somebody accidentally uses +5 VDC on that input. I should probably put a 5.6V zener on there to further protect things, but there's not much space left now. 2. Put the 1000 pF capacitor in parallel with the 4.7 uF capacitor like you suggested. 3. 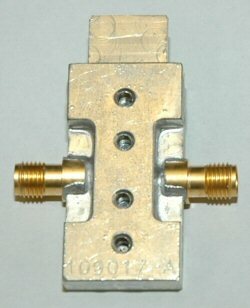 Installed a coaxial in-line highpass filter. 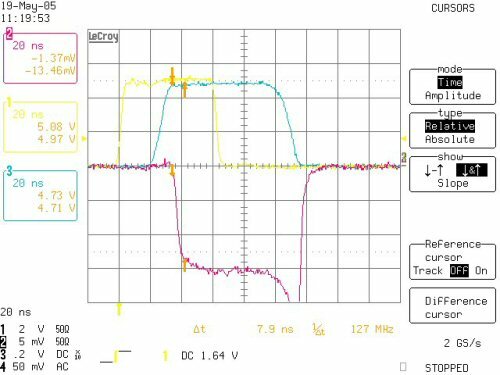 It's an RLC electronics F-100-1500-2-R, 2-pole with cutoff at 1.5 GHz. It cost $320 plus a not-insignificant NRE, so the project turned out to be over budget in the end (this is NASA, after all). Now if somebody else wants to duplicate this work they can be sure to keep RLC honest if they try to re-quote the NRE charge. I've attached updated plots that should match plots I already sent you. You can see now that the glitches are completely gone thanks to the highpass filter. I even turned the volts/division knob all the way down to 2mV/div and there is absolutely nothing there when the RF is absent. The high-speed O-scope plots look cleaner now that the RF isn't offset by the glitch. The risetime didn't really change much with that 1000 pF capacitor. I'm showing it to be about 8.6 ns The falltime is really fast -- about 2.4ns! That was hidden before due to that glitch. I sent two new pictures as well. You can see that we had to move that 4-pin molex connector over to make room for the 1000 pF cap. The network analyzer and spectrum analyzer plots you have up should still be valid. Hopefully we can call this page complete now!" 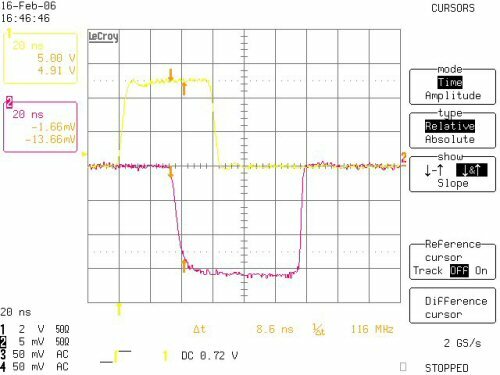 "I noticed that the pulsed RF spectrum didn't look quite right on my measurements so I plugged back into the high-speed oscilloscope and learned something useful: the pulsed RF output is about 15 - 20 ns longer than the 5V input pulse. Regardless of the input pulse width, there's a constant "stretching factor" of about 18 ns or so. I should have noticed this earlier -- you can even see it on the plots I've sent you with the driver voltage shown. For some reason, that driver is a little slow to turn off. I've attached one more plot to show the phenomenon in the pulsed RF output. You'll see that my input pulse is 60 ns wide but the RF output lasts for about 78 ns. Looks like I need to make a new label for my box! As a side note, the spectrum plot you have is a little off since I really had a PW=1.018 us. I won't tell if you don't. " "The perfectionist in me has won the battle over the lazy man. Here is a new spectrum plot with a true 1us pulse width (I used a 982 ns input pulse). Now those nulls fall in the correct places."